How Mike Pence embraced ACA Medicaid expansion in Indiana. Mike Pence successfully expanded Medicaid in Indiana. He would have rather torpedoed the law—and hurt his former constituents—than admit that it works. Then–Gov. 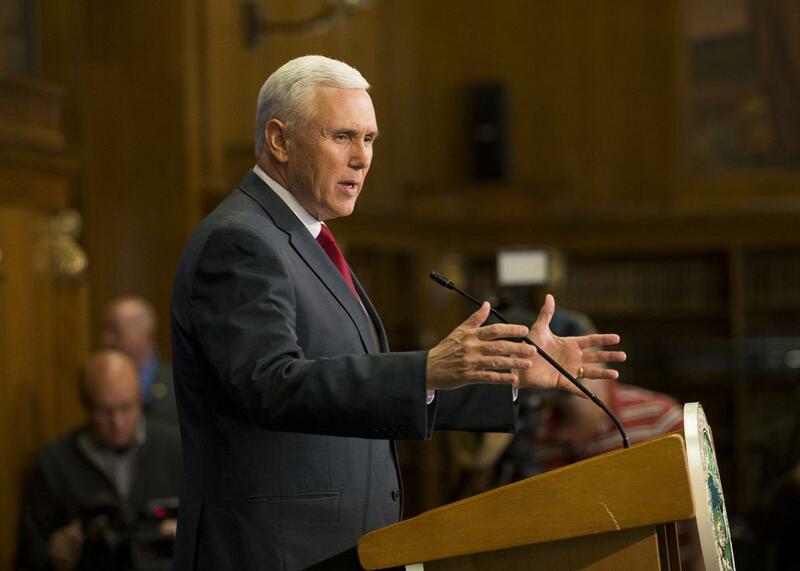 Mike Pence of Indiana holds a press conference March 31, 2015, at the Indiana State Library in Indianapolis, Indiana. No part of that claim is true, and Pence surely knows it. As governor of Indiana, he implemented the ACA’s Medicaid expansion to great success, modifying the program to address what he perceived to be his state’s unique needs. Now Pence is championing a bill that would undo much of what he accomplished in Indiana, stripping insurance from the very people who received it under his plan. Graham-Cassidy redistributes federal funds from blue states to some red states—but not to Indiana: The bill would slash federal funding for Indiana by $7 billion between 2020 and 2027, denying health coverage to nearly 500,000 Hoosiers over the next 10 years. It is, in other words, another version of the same concept that Republicans have pushed for months: a massive cut to Medicaid under the guise of ACA repeal. As vice president, Pence has unceasingly promoted measures that would undo his signature achievement as governor. (As of this writing, Graham-Cassidy appears to be dead, but recent history suggests the repeal effort isn’t truly over until the Sept. 30 reconciliation deadline passes.) More pointedly, he has promoted these measures using a rationale he has already himself disproved. Why? Pence obviously wants to remain loyal to his boss and the GOP agenda—but he’s also boxed in by his own past success. If the vice president told the whole truth, he’d have to admit that as governor he showed that the ACA already allows states to “innovate” with “new ideas” about health care. According to Republicans, Graham-Cassidy seeks to solve the alleged inflexibility of Obamacare toward states that want to color outside the lines. But Pence’s own record proves that this problem is simply nonexistent. The story of how Mike Pence briefly lurched leftward on health care is well-known in Indiana but rarely discussed outside the state, where about 400,000 people gained Medicaid coverage because of him. It’s a story of how even though Pence entered the governor’s office in 2013 stringently opposed to Medicaid expansion, he was able to change his mind and sign a bill that he touted as rebelling against the ACA, even though it was part of the ACA. And it is, at bottom, a story about how, for Pence, ideology will always overrule governing principles in the long run, no matter how effectively they had once served him. This story begins in June 2012, when the Supreme Court modified a key provision of Obamacare. As written, Obamacare had compelled every state to extend Medicaid eligibility, but the court found this provision unconstitutionally coercive and made Medicaid expansion voluntary instead. (States could still modify their programs with federal approval.) As of 2017, 19 states still haven’t expanded the program. At the start of his governorship, Pence argued that Medicaid was broken and that its expansion would only compound existing problems. But even this initial logic had a flaw: Indiana had already expanded Medicaid before the ACA, through a popular program called the Healthy Indiana Plan, now known as HIP 1.0. Designed by the administration of Republican Gov. Mitch Daniels in 2007, HIP 1.0 was initially meant to plug gaps in coverage for childless adults and those who lost coverage during the recession. It wasn’t progressive, exactly: The program included a lifetime cap on insurance benefits, for instance, and excluded maternity care. By 2013, now–Gov. Pence had several options: Continue to reject expansion, accept it wholeheartedly, or apply for a waiver that would qualify Indiana for a modified expansion. A coalition of hospital associations, religious entities, minority-serving organizations and health care advocacy groups began lobbying Pence to expand Medicaid in some way. Most of those at the table had worked with Daniels to create HIP 1.0. Once again, Verma—this time as Pence’s chief health care guru—crafted a compromise solution. It’s unclear exactly what ultimately convinced the Pence administration to take this path; most likely, Pence believed that the ACA was here to stay, and decided to adapt it to Indiana with as conservative a spin as he could muster. HIP 2.0 had to abandon lifetime caps and extended essential health benefits, a non-negotiable requirement under the ACA. And, like all Medicaid expansions, it dramatically enlarged the group of people who qualified for coverage. But the program also maintained features of its predecessor that Pence referred to as “skin in the game,” a qualification that became crucial to his ability to describe HIP 2.0 as “better” than anything Obamacare could do. It works like this: HIP 2.0 requires enrollees to pay into “POWER accounts” on a sliding scale based on income. These function like health savings accounts: The state contributes most of the money, but the individual also contributes, and uses the funds to pay deductibles. Most individuals pay very little into their POWER accounts, often just a few dollars a month. If they miss a premium payment, however, they are punished. Enrollees below the federal poverty line are bumped down to a less generous plan with more copayments. Those above the federal poverty line are locked out of coverage altogether for six months. HIP 2.0 includes other punitive provisions meant to nudge individuals toward healthier habits. Enrollees are required to make co-payments on emergency room visits, for instance, and may be charged a fee if they go to an ER for non-emergency treatment. “HIP 2.0 is not intended to be a long-term entitlement program,” Pence declared. “It’s intended to be a safety net that aligns incentives with human aspirations.” Pence often bashed “traditional Medicaid” before championing HIP 2.0, as though it were entirely novel and distinct. He spoke at hospitals to tout the plan in front of approving doctors and discussed it with President Barack Obama. Naturally, Pence had a strong political incentive to overstate the extent to which HIP 2.0 departed from traditional Medicaid expansion. But his creation really did include a number of unusual adaptations, adjusting Medicaid to fit Pence’s own vision of reform. To obtain federal matching funds, Pence had to apply for a Medicaid waiver from the Department of Health and Human Services. HHS could only grant the waiver if it believed that HIP 2.0 furthered the key goals of Medicaid expansion. In January 2015, the agency issued the waiver. The Obama administration was satisfied that Pence’s “skin in the game” would not significantly detract from the program’s effectiveness. This is how, in HIP 2.0, politics and policy reached an (increasingly rare) happy marriage. The program allowed Pence to frame it in free-market and personal-responsibility terms while he was actually strengthening the social safety net. HIP 2.0 began enrollment as soon as Pence announced its approval, and today it covers about 400,000 Hoosiers—a tenfold increase in coverage from HIP 1.0. It is widely regarded as a success that has increased preventative treatment, decreased ER visits, and relieved the burden on rural hospitals by reducing uncompensated care. Progressives occasionally criticize its punitive rules, which do trip up enrollees: Thousands of people have found themselves temporarily denied coverage because they forgot to pay their premiums just once. But on the whole, the program has not proved to be unworkably harsh. I asked Republican state Rep. Ed Clere—an early proponent of Medicaid expansion and former chairman of the House Public Health Committee—whether he felt, as Pence claimed, that HIP 2.0 triumphed because of Pence’s “skin in the game” tweaks. “I certainly support the desire to promote personal responsibility,” Clere told me, “as do folks on both side of the aisle. But the personal responsibility requirements of HIP 2.0 are not what has made it successful.” Instead, Clere highlighted two related reforms. First, the state assigned enrollees to one of four Managed Care Entities, which are paid a flat monthly rate for each participant. Because of this capitated rate, the MCEs only make money when they keep patients healthy. This profit incentive encourages MCEs to work directly with patients to improve health outcomes, coaxing them into preventative care to save money down the road. By fostering this proactive approach to health care, HIP 2.0 frees up funds for its second key reform: The program reimburses health care providers at Medicare rates, which are substantially higher than Medicaid rates, a genuine innovation that the federal government approved. And, as Clere put it to me, “when you pay providers more, more providers participate.” In traditional Medicaid programs, rural enrollees frequently struggle to find doctors who accept Medicaid, while urban enrollees are stuck with just a few perpetually overbooked providers. But in Indiana today, most HIP 2.0 patients can find care with little trouble. Pence had promised market-based Medicaid reform. And in a very real way, he delivered. Pence and Verma are responsible for proving the flexibility of Obamacare, and they are currently attacking Obamacare on the grounds of its ostensible inflexibility. This disingenuous reversal makes it difficult to understand why they bothered with HIP 2.0 in the first place. But bother they did, to the benefit of hundreds of thousands of Hoosiers. Now, a few years later, Pence has stood poised all summer to break a potential Senate tie and send Obamacare to its grave. Pence embraced HIP 2.0 begrudgingly, only after reframing it as a conservative opportunity. ACA repeal, on the other hand, is a seven-year political promise that aligns perfectly with his anti-government instincts. HIP 2.0 was a pragmatic Republican experiment; ACA repeal would complete an ideological Republican mission. On one level, this is just Washington. On another, it is a vivid illustration of the vice president’s uniquely cynical approach to health care. Pence has known all along that states have plenty of flexibility under the ACA, and that the Trump administration could give them even more. But he would rather blow up the law, and gut Medicaid in the process, than admit that the law is working as intended. Pence may not get the chance to break a tie on ACA repeal—but he has already proved himself to be Washington’s biggest hypocrite of health care reform, a saga notorious for making monsters out of men.